Paul George will win the Comeback Player of the Year award: If I get everything else wrong, I’ll get this one right. (Update: THE NBA doesn’t have a CPOY award, so I even got this one wrong. Thanks to Jared Wade of 8 points 9 seconds for catching my silly mistake.) The easiest of predictions that anyone could ever make. PG has looked like he’s 100% on the court during the preseason and training camp, and no one is voting for anyone else for CPOY but the guy who snapped his leg in half 14 months ago. Bonus PG prediction: Paul George will average a career high in points. Ian Mahinmi will average a double double: Yeah, I said it. IAN MAHINMI. DOUBLE DOUBLE. Mahinmi worked tirelessly this offseason with George Hill in San Antonio and the dividends are already evident. Mahinmi says he put up over 1,000 shots a day during the summer and as the Pacers starting center with a lineup full of shooters, he’ll get a lot of open looks. The majority of these looks should still come inside off of drives from Hill, George, and Ellis. With Mahinmi being the only true big in the starting lineup, he’ll be the main rebounder as well. He won’t take many shots, but he should be efficient. I see no reason why he can’t average 10 points and 10 rebounds per game. Bonus Ian prediction: Mahinmi will shoot better than 50% from the foul line. Myles Turner and Joe Young will make the All-Rookie 2nd Team: Turner and Young have looked like steals since lighting up the Orlando Summer League. The only thing that’s stopping me from putting them on the All-Rookie first team is that they’ll be coming off the bench for the Pacers while I suspect that other rookies (Karl Anthony Towns, Jahlil Okafor, DeAngelo Russel, Stanley Johnson) will be starting and playing heavy minutes for their teams. I analyzed both of Turner and Young’s Summer League (here and here), and they both look like keepers for the long term. Bird called Turner the Pacers best shooter, and his best skill is probably defending the rim. Turner averaged a couple blocks per game during the preseason in limited minutes (his soreness in the knee is a little worrisome) and should continue to get blocks at a high rate until offenses make adjustments. Young is as natural a scorer as the Pacers have on their roster. He’s slotted for the backup point guard duties, and he’ll have multiple scoring outbursts during the course of the season. Bonus Young predicition: Young will score 35 in at least one game this season, and be in the running for MVP of the Rookie/Sophomores Game. Bonus Turner prediction: Turner will lead all rookies in block shots. Monta Ellis will average his lowest points per game since his second season in the league (16.5): Ellis will be a great addition to the Pacers offensively, but he’s turning 30 and should be playing second fiddle to a healthy Paul George all year. The Pacers have a lot of mouths to feed in the starting lineup, and I think it’ll lead to a slight scoring decline for Ellis this season. If this happens, I think it’ll be a good sign for the Pacers that they’re still getting Aggressive George Hill, CJ Miles, and Rodney Stuckey their fair share of shots as well. Bonus Monta prediction: Ellis will hit at least 2 buzzer beaters for the win this season. The Pacers will finish in the top-10 in offensive efficiency: All signs are that the new system will work and work well. The Pacers efforts to run and push the pace while playing small should be rewarded on the offensive end with a very solid top-10 ranking. Preseason is the preseason, but they were top-3 in the preseason. The top-10 ranking would be a huge jump from past years when the Pacers played big and slow. Solomon Hill will be out of the rotation completely by midseason: Solo started 78 games for the Pacers last season, but if he still has a spot in the rotation it won’t last for long. After Solo’s pitiful performance in the Summer League where he clearly underestimated the level of the competition, Hill didn’t play much in the preseason due to minor injuries. Glenn Robinson III and Chase Budinger took full advantage of it and look like guys much more deserving of minutes than Hill does. Bonus prediction: GR3 will make the Timberwolves and 76ers regret giving up on him so early in his career. The Pacers will make the playoffs with a seed in the 6-8 range: Most sportswriters are not so optimistic on the Pacers chances this year with about 2 of every 3 predicting a trip to the lottery for the Indiana Pacers. While a roster this young and inexperienced playing together will struggle to take a top seed in the East, I see no reason why they can’t make the playoffs if everyone stays healthy. 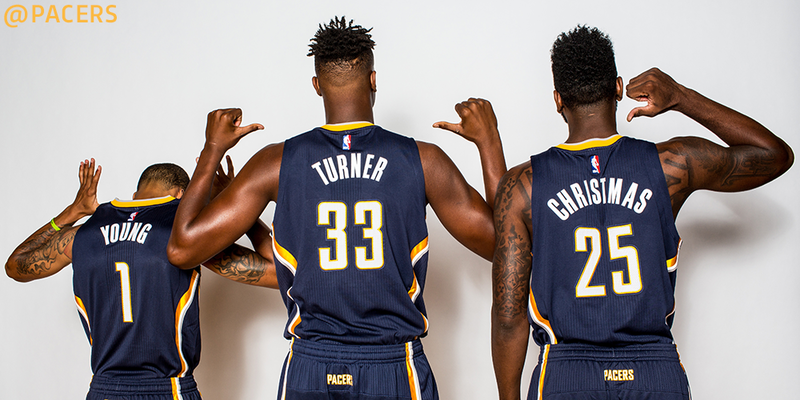 In a few years, I think the Pacers will be able to seriously contend, but right now? I think the best case scenario is an upset win in the first round of the playoffs. George Hill will be blonde all season long: Unfortunately. I’m doing a Twitter giveaway for my followers. All you need to enter is RT the tweet below and follow @iPacersblog. 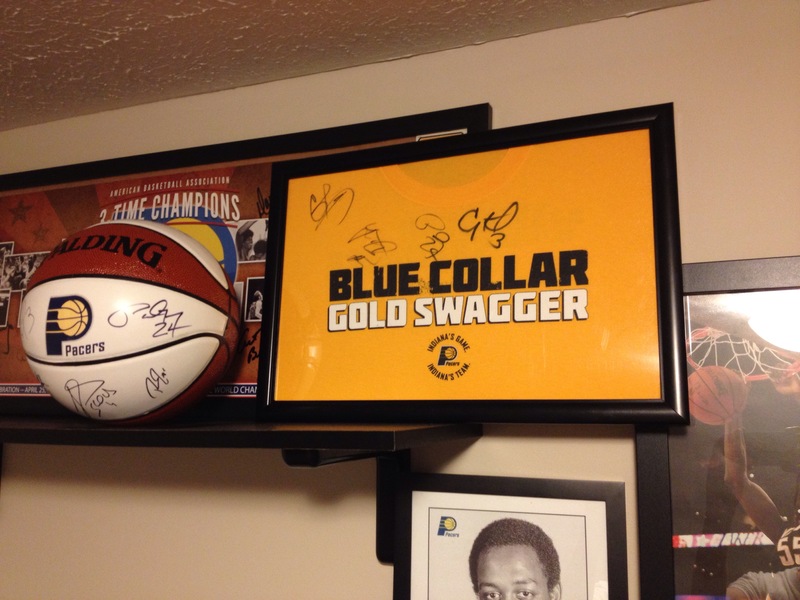 This is a framed Blue Collar Gold Swagger shirt signed by Paul George and George Hill as well as former Pacers Lance Stephenson and Gerald Green. The giveaway will end on November 14, 2015 or when I reach 300 followers (whichever happens last). The shirt is no longer wearable, but looks great in the frame just as seen in the picture. A great addition for your Pacers wall!